Title* -- Title -- Mr. Ms. Mrs. I have read and agree to the conditions detailed in the user agreement. 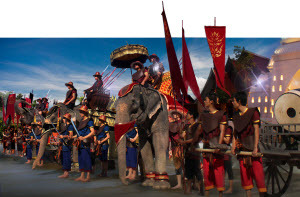 The tour price is quoted in Thai Baht and includes as outlined in each tour description. Expenses other than those specified in each tour itinerary e.g. tips or any items of a personal nature are not included in the price quoted. After reservations and payments are made, you are required to print Tour Vouchers from our booking system. You are required to present Tour Voucher to our tour guide/driver when pick up. All tours are pre-arranged packages and no individual program changes or modifications can be made. Laguna Excursions Limited reserves the right to rearrange the order of any tour itinerary, to cancel or to substitute elements of any plan without notice when local conditions force such changes. The tour member hereby indemnifies and holds harmless Laguna Excursions Limited, and/or all their affiliates, directors, officers, agents and employees from and against any liability for injury including death and damage to or loss of property, losses, delays, claims, damages or demands which may be suffered by the me and/or my child (ren) arising out of or in any way connected with my and/or our participation in any such activity/trip to which Tour Voucher applies.